If you will allow r me, I will tell you something about these charac teristic proceedings. The Congress was opened on Thursday, the 4 th September, at four o clock in the afternoon. I could not believe it possible that one of my trusty comrades least of all Rauf Bey had taken up such an attitude as this. I told Husri rather sharply not to talk such rubbish, and added that what he said could not possibly be true; further, that he had no busi ness to spread rumours that could only lead to misunderstanding amongst our friends. I attached no importance to the question as to who should take the Chair at the Congress. As far as I was personally concerned, I thought it far preferable that an older man should be selected. I asked some of the others what they thought about it. I met Rauf Bey with others in the corridor as we were going into the congress room. This convinced me that Husri Bey was right and, naturally, I was rather upset about it. It is true that at the Erzerum Congress some people had thought that I ought not to be elected Chairman, but I happened to know something about their characters. Now that my most intimate associates appeared to be of the same frame of mind I began to wonder. 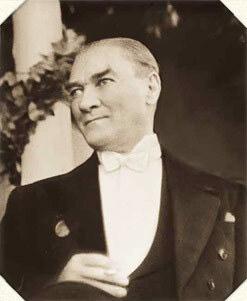 “I understand,” I said to Rauf Bey, “this is the conclusion you came to at Bekir Sami Bey s house.” Without waiting for him to reply, I left him and walked into the congress room. It is a remarkable coincidence that the proposer s name began with A, and so did that of the province which he represented. After I had formally opened the meeting with a speech, I provisionally occupied the Chair in my capacity as the founder of this Congress. “Why should that be necessary?” I asked. While I, in spite of infinite difficulties and obstacles, devoted my self heart and soul to the work which I felt convinced would enable me to find a way to save the country and the homes of each one of us including that of the mover of the proposal from falling into the abyss of misfortune that lay in front of us, the next speaker in troduced personal questions. He was an old man, for whom I had great esteem but who had only just arrived from Constantinople and, therefore, could naturally have had only a superficial knowledge of the real situation. I proposed that the motion should be put to the vote. This was rejected by a large majority. Then I proposed that the Chairman should be elected by secret ballot, and this resulted in my being elected practically unanimously, with only three votes against me. It was agreed that the Sivas Congress should deal with the resolu tions and the manifesto already passed by the Erzerum Congress, as well as a certain motion drawn up by the members approximately numbering twenty-five who had arrived at Sivas before us. The first three days the I st , the day of the opening, the 5 th and the 6 th September were taken up with discussions about the oath we were to take, to show that we were not “Unionists”; also, with the exact wording of this oath, an address to the Sultan, and replies to telegrams that came when the Congress was opened. An important question was, whether the Congress should concern itself or not with politics. Does not the last one appear very strange, considering that the struggle in which we were engaged was essentially of a political char acter? At length, on the 4 m day, we reached the principal object of our meeting and began to discuss the resolutions passed by the Erzerum Congress, to which we lost no time in agreeing. The reason for this was that we had already prepared amendments to the main resolution, so that everybody was familiar with them in advance.